On The 21st: With the new Pritzker administration, we’re talking to different stakeholders about their hopes for the next four years. Today: businesses. Plus we hear from filmmakers involved in a new series called Reel Midwest. And, more on some of the recent discoveries around black holes. 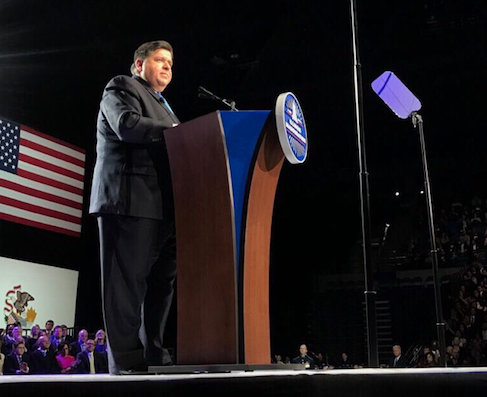 As of Monday, Illinois has a new state government, from the governor’s mansion to the Statehouse in Springfield. And all of this week (as well as next week) we’re taking a look at different sectors of our state and talking to folks about what they expect for the next four years. Yesterday, we spoke to two statewide social service providers, Children’s Home & Aid and the Illinois Behavioral Health Association. Today, we’re turning to business and two groups that represent some of our biggest economic sectors- manufacturers’ and retailers. Mark Denzler is the President & CEO of Illinois Manufacturers’ Association. Rob Karr is the President & CEO of the Illinois Retail Merchants Association. They both joined us on the line. When it comes to the movie industry, we often think of the East and West coasts as the epicenters of talent. But a new independent film series hopes to show that’s nothing but a myth by highlighting documentaries, features and short films from Illinois and its neighbors. It’s called Reel Midwest and it premiered on WILL and WTVP in Peoria recently. Moss Bresnahan is the President and CEO of Illinois Public Media, which produces the 21st and is home to WILL radio and TV, and he’s one of the people bringing Reel Midwest to our small screens. Two of the filmmakers participating in Reel Midwest also joined us. David Rocchio is one of the producers of The Gun Shop. And Arlen Parsa is a Chicago documentarian behind The Way to Andina. Last summer, twin telescopes in Hawaii captured a bright anomaly 200 million light years away. It was there, then it was gone, just as quickly. It turns out, that moment might have been a star becoming a black hole. That comes after other news last month of new gravitational waves detections that helps shed light on entire populations of black holes. Shane Larson and Chris Pankow joined us. They're both astrophysicists at Northwestern University and they spoke to us from our Evanston studio.